Even though the rugged men of the Corps of Discovery were alone in the wilderness -- far from the sound of liberty bells or fireworks in Boston -- Independence Day still had meaning. Camped with their rugged men on the banks of the Missouri River, Lewis and Clark ordered the firing of a cannon to celebrate the day. This act of celebration may have only been heard by muskrats, raccoons, Great Blue Herons, or a lone Indian in some nearby wood, but its echo vibrates across two centuries. That same cannon shot was heard by a million Americans who set out on horseback or in covered wagons to follow the route of Lewis and Clark. That shot echoed a short way downstream in 1860, and was heard by daring young men who rode fast ponies while they carried mail to California. 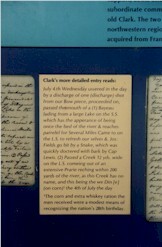 That cannon blast on July 4, 1804, was really a shout -- a shout that announced to the West, "Here Comes America!" I heard that cannon shot as I stood on that same stretch of riverbank in Lewis and Clark State Park. I watched in the imagination of my eye, the Corps celebrating the glory of being Americans.